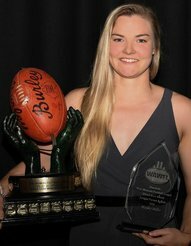 Subiaco Lions Football Club’s Hayley Miller has won the Mundella WA Women’s Football League’s Dhara Kerr Fairest and Best at the 2018 Medal Presentation Dinner on Monday night at the Hyatt Regency, Perth. The announcement is even more impressive when it is pointed out that Miller played her first game in round 5 of the season. Held in front of more than 245 guests, the Medal Presentation Dinner celebrates the Mundella WA Women’s Football League’s Fairest and Best players within the competition. President of the WA Women’s Football League Carolyn Hills opened proceedings by recognising the milestones of the year, including recognition of West Perth who won the Mundella Cash for Clubs competition, Coastal Titans alignment to become Subiaco Lions and the fifth Yorga’s Koodjal Kadadjiny match held in July. "The 2018 season was another successful year of the WA Womens Football League"
"None of our success over the past 31 years is possible without the invaluable contribution of our clubs and volunteers who power them" Carolyn said. Honoured with the Mundella WAWFL's highest playing award Subiaco Captain Hayley Miller graciously accepted the title of the Dhara Kerr Fairest and Best. 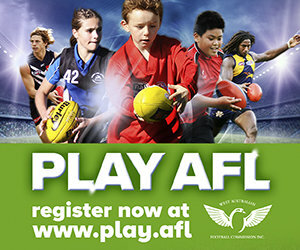 The AFLW Fremantle Dockers player continues to break the mold as her fast pace and courage on the field gains respect from teammates, opposition and spectators alike. In an exciting finish that went down to the last round of the season, Miller was able to claim the winning vote in the final game to secure her final tally of 24 votes. Swan Districts Gemma Houghton was hot on Miller's tail and chased throughout season, falling just one vote short to finish on 23. Finishing third was East Fremantle's Belinda Smith who finished on 21 votes. Finishing in a tie with 17 votes, Reserves players Renee Holwill from Swan Districts and Tahlea Martin from East Perth were both awarded the Reserves Fairest and Best. Just one vote behind, second placed Hereripenne Williams of Peel Thunderbirds chased the heels of the eventual winners, with Claremont's Angel Hayward finishing third on 15 votes. The 2018 Rogers Cup Fairest and Best was won by Jacklyn Atkinson, from Peel Thunderbirds with a total of 22 votes. Jacklyn took the win by just one vote as East Perth's Mikayla Morrison finished with 21 votes, and Subiaco's Abbey Dowrick and Swan District's Nyra Anderson shared third spot with 19 votes. With 78 goals to her name for the season, the Joanne Huggins Leading Goal Scorer award was won by Peel Thunderbirds Kira Phillips for the second year in a row. The Reserves Leading Goal Scorer was awarded to Narelle McIntyre from Peel Thunderbirds who kicked an impressive 40 goals, while in Rogers Cup there was a tie as Jenna Bantick from South Fremantle and Aimee Hiscock from Swan Districts took out the title for Rogers Cup with 24 goals each. Also presented on the night were our rookie awards which are awarded to players competing in their first year of football that record the most votes across the year. The Cath Boyce Rookie of the Year was awarded to Subiaco Jayme Harken, Reserves Rising Star award went to Ashlee Sidebottom from Peel, and Rogers Cup Rising Star was awarded to Subiaco's Kia Buckley. South Fremantle's Jenna Allomes was recognised as the 2018 Lynette Smith Volunteer of the Year award who has over twelve years dedication to South Fremantle. Jenna's passion and motivation to improve the South Fremantle Women's Football Club and our competition, make her a worth recipient of this honourable award. New life membership was also recognised during the night with current WAWFL President Carolyn Hills joining the elite group. Life Membership is the pinnacle level of recognition within the WAWFL, so it is fitting that Carolyn's 14 years of commitment to the bettering of the WAWFL and female football in WA was recognised with this honour. League, Reserves and Rogers Cup Grand Finals take place this weekend at Claremont Oval, Claremont. Entry is $5 per person, including a year book. Bounce down for League game is 2:30pm, following Reserves at 12:00pm and Rogers Cup at 10:00am. All finals will be streamed on the Mundella WAWFL Facebook page.